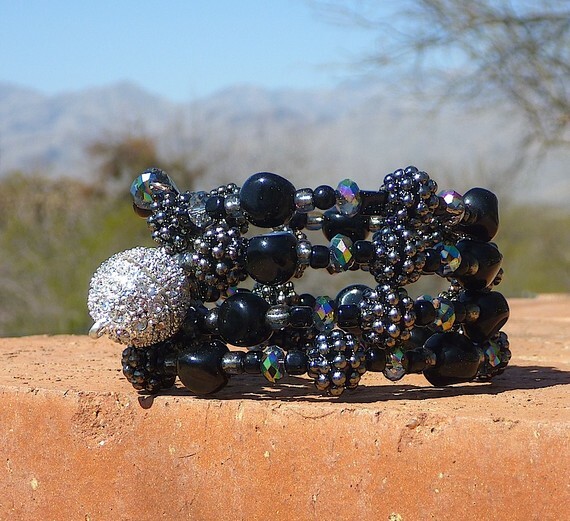 HEART of Tucson horse rescue has so far done a marvelous job promoting the Beading Diva bracelet sales on their Facebook page. On the first day of March, 11 bracelets were sold! They were at the Arizona Animal Fair with their rescued mini horses which proved to be very popular with the crowd. You can read about their many horse rescues here. One particular former racehorse named “Gifted” has a sad story (not unlike racing greyhounds) but luckily has found his way to HEART of Tucson and is on the road to hopeful recovery. You can read the story about Gifted here. One of a kind bracelets are available online (add $3 S&H) via Etsy.com. You can also purchase them from Silver Sea Jewelry & Gifts, 330 N. 4th Ave., 520-624-9954 OR Dirty Dawgs dog wash, 2510 N. Campbell Ave., 520-777-6045. Every bracelet is handcrafted from beautiful beads which have been given to Beading Divas to the Rescue from our latest Bead Drive as we raise money for numerous animal charities. Bracelets cost $20/each and no two bracelets are alike. Not only do you get an original piece of jewelry but it’s meaningful too. You can read about our donation history here.